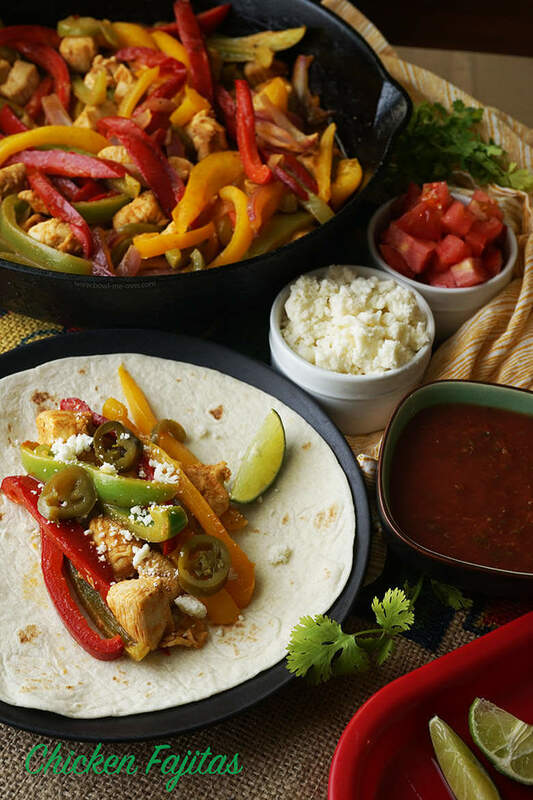 Today as we’re heading into a long weekend, I’m going to hook you up with some excellent Chicken Fajitas plus 5 more recipes, so you can have the BEST meal with the most delicious food! Trust me you’re going to be set! 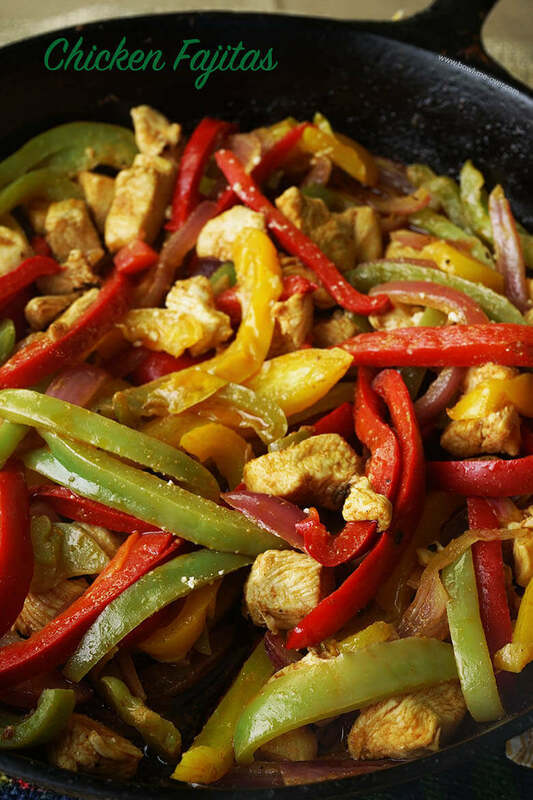 Easy Chicken Fajitas made in a skillet – super delicious and perfect for a party! I love fajitas, don’t you? Chicken Fajitas are an easy weeknight meal and the leftovers are fabulous! Fajitas are also great for a party and easy to make at home. You can purchase a fajita marinade, but why not make your own? You can control the sodium plus get fabulous flavor with just a little effort! Fajitas are easy to make at home too! The marinade is easy to make. You’ll start with the spices – cumin, paprika, coriander, garlic, salt & pepper. Mix that with a little lime juice and olive oil and that’s it! If you’re serving a crowd, double the recipe and put the veggie and chicken in separate Ziploc bags. That way you can cook them to the right “done-ness” more easily. 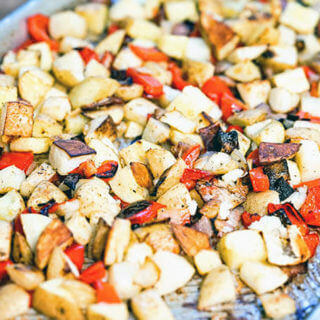 Also if you have a vegan or vegetarian diners, then you won’t have to make a separate dish! Everyone loves fajitas, don’t you agree? Aren’t the colors of the peppers and onions beautiful? This meal is simple and quick! 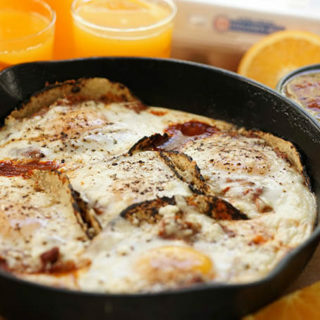 And you know what….if you’re lucky enough to have some leftovers, they make a killer omelet on day two! Or here’s another idea add the leftover fajitas to a bowl of crunchy lettuce. 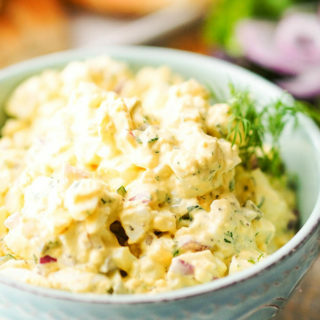 Add salsa and a bit of sour cream – instant salad! And remember I said I was going to hook you up? Here is the rest of the meal – a cocktail, guacamole, rice and beans – even a recipe for mini churros! Check this out! Having a party? Here’s everything you need to run out the menu! Every party needs a cocktail! Let’s start this party with a margarita! In fact, make a pitcher – you can find the link here from An Affair from the Heart! How about some guacamole? 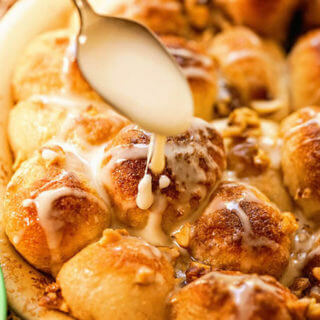 This recipe from A Kitchen Hoors Adventure is sweet, spicy and delicious! Rice and beans are also a must! The Spanish Rice recipe is from the Foodie Affair and Black Beans from Hostess at Heart you’ll love this recipe, it’s quick & easy! To wrap up the party let’s go back to the Foodie Affair for Mini Churros! Are you set? All you need now is music, let’s get this party started! 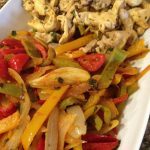 Love fajitas - such an easy weeknight meal, plus the leftovers are fabulous! You can buy a marinade at the store, but why not make your own? 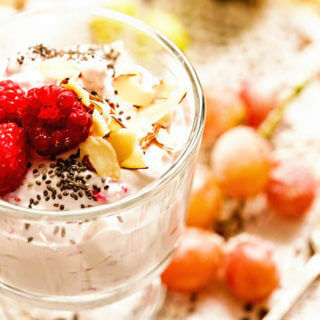 It tastes better and you can use good quality ingredients! 2 bell peppers your choice - red and orange or yellow and green, thinly sliced - just mix it up! Prepare & slice/dice the chicken. Put in a gallon Ziploc bag. Slice the peppers and onion - add them to the chicken, set aside. Combine the remaining ingredients; oil, lime juice, cumin, paprika, cilantro, garlic, salt & pepper into a small bowl, whisk to combine. Pour marinade over chicken and peppers, seal tightly and mix the marinade throughout the bag to combine. Put the bag into a large bowl (just in case it springs a leak!). Flip the bag a couple of times to distribute the marinade. On a hot grill or with a heavy fry pan, heat to medium/medium-high and fry until the veggie are just crisp and the chicken is cooked thru. Here’s a couple more ideas for you! Serve some salsa alongside, try my Pico de Gallo and Mango Salsa, yum! Having a party? 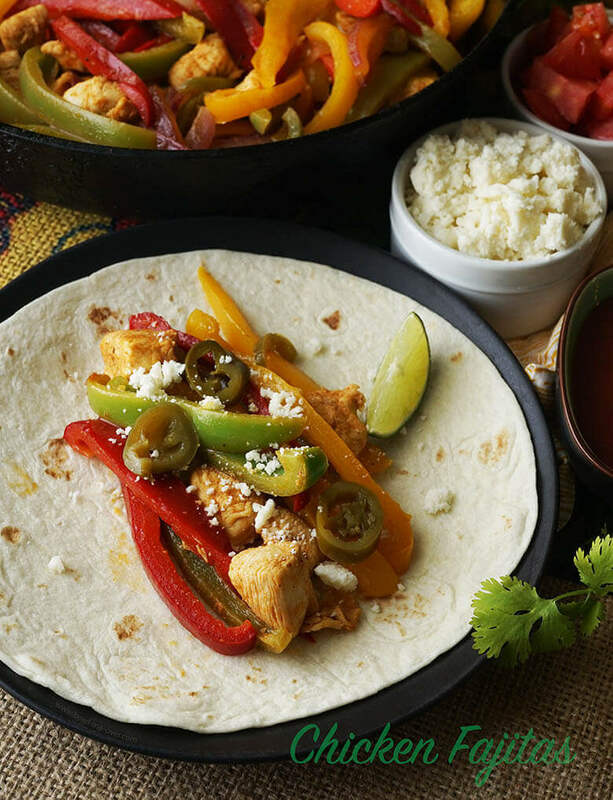 Start your fiesta off with a bang by serving Chicken Fajitas! Crowd pleasing meal great for a party or for a fun night at home, flavorful and fabulous! I love a great Fajita and you sure have a knack for putting this kind of dish together! Thank you for putting my beans in there. That is definitely a meal that I’d love to have on my table! Thanks Julie! Those beans really round out a great meal – I just love Mexican food! I love fajitas and your marinade sounds so delicious! I also love all of your great ideas for using the leftovers, I’d make a double batch just to be sure I had enough for leftovers! Thanks Lisa, it’s such a yummy dish and if you can enjoy it again with a twist? Always a winner. Thank you so much for stopping by! Very nicely done and beautifully photographed! I love fajitas and for some unknown reason I’ve never made them. 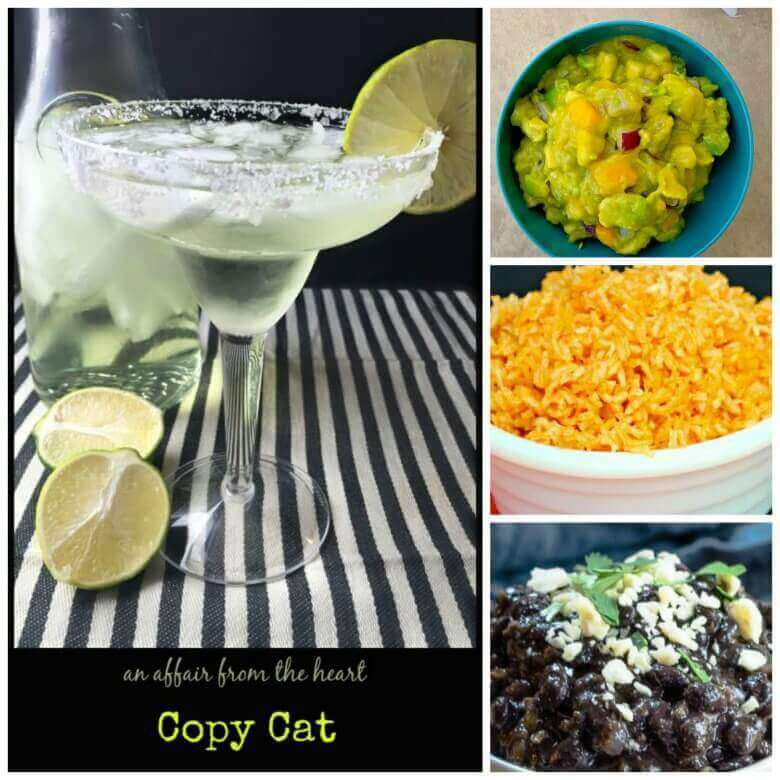 I love the use of lime juice in this recipe; I can only imagine how great this must have tasted! Thank you Dan, I think it’s time for you to make some fajitas! I’m sure the boys will love them!!! I love that idea Sandra – why not use the leftovers for lunches, brilliant! Enjoy!!! I’m loving your chicken fajitas…that’s one dinner everyone here can always agree on! And I love the rest of the dinner…makes life easier when it’s all planned out for you! Thanks Michelle! Same here, everyone loves fajitas such a great meal! I’m a total fajita hoor. If they’re on the menu I will order them. Can’t wait to make these at home! I know right? 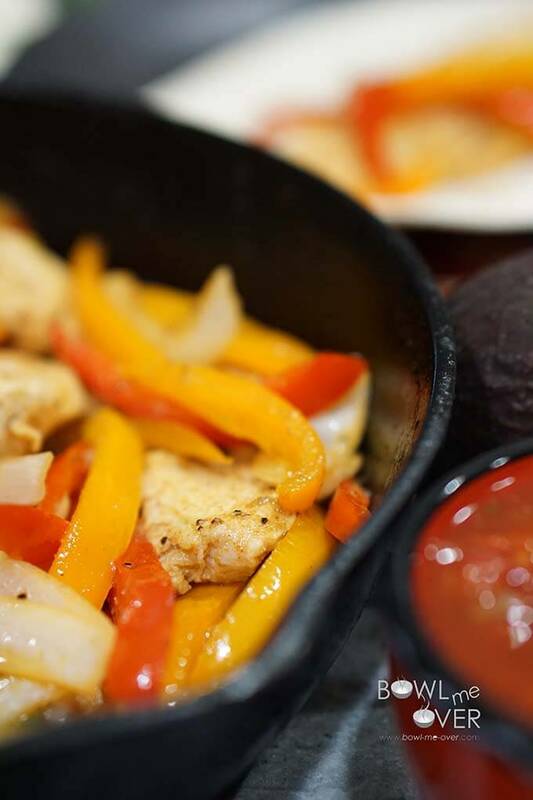 Love a great fajita – yum!!! Chicken fajitas are a favorite of mine! I can’t wait to try your version, they look great! 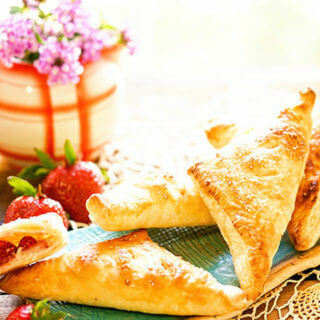 Yum, yum, yum – you’ll love these Madi, enjoy!!! These are amazing!! Adding them to the menu plan this week! Wonderful Michaela – enjoy! Fajitas are one of our favorite meals!!! Chicken Fajitas are a family favorite over here! I have to try your recipe. It looks DELICIOUS! Thank you so much, I appreciate the compliment! Enjoy the fajitas, it’s one of our favorites!!! I love fajitas so much and order them at the restaurant, mostly because I love the sizzling sound they make when they bring them out on the o hot pan. But they are also a great way to feed a crowd! I so agree Jennifer, I LOVE that sizzle! So much fun – I need to get one of those pans, that would make it that much more fun – thank you so much for stopping by!! Give me a good chicken fajita and a margarita any day!! These look soo good! Ole! Got everything you need right there for a great party – ole right back at ya! 😀 Thanks Deanna!! !